Jagannatha Dasa of Manvi was a great devotee of Raghavendra Swamy. This post is about the Jagannatha Dasa who wrote Sri Harikathamrutasara and not the other Guru Jagannatha Dasa of Kosigi who was also a Haridasa. Jagannatha Dasa of Manvi was in his poorvashrama days known as Srinivasacharya. He became a disciple of Vijaya Dasa who gave him the ankita Jagannatha Dasa. Jagannatha Dasa (1728-1809) is believed to be the brother of Prahala who was reborn as Vyasa Raja (1460-1539) and Raghavendra Swamy (1595-1671). Now wonder, the Dasa had great attachment to Rayaru. It was almost a daily routine for Jagannatha Dasa to stand before the Brindavana in Mantralaya and speak to Raghavendra Swamy. Soon, people began noticing this and they pestered the Dasa about his speech. They were also curious about what the Dasa would take to a Seer sitting in the Brindavana. It became such a nuisance that Raghavendra Swamy stopped talking to Jagannatha Dasa. A mournful Dasa sang, “ Yaake Muukanadeyo”. Rayaru was so enraptured by the devotion and sincerity that he decided to appear in the Dasa’s dream from then on and told him so. Jagannatha Dasa was also a regular visitor to Bichale. The serene Tungabhadra, the house where Rayaru stayed, the Japada Katte and the many idols installed by Madhwa seers thrilled the Dasa. He sang and danced as if in a trance in the Japada Katte. Many were the compositions that the Dasa composed at Bichale. The quiet flowing Tungabhadra provided the perfect setting for his songs. The Eka Shila Brindavana at Bichale and the Anjaneya idol on top of it drew him like a magnet. The story of the friendship between Raghavendra Swamy and Appanacharya was an inspiration for him. On one of his visits, Jagannatha Dasa presented a copper vessel, called Hande in Kannada, to the descendents of Appanacharya so that they could cook rice in it. The Hande is so big that it can cook of 25 kilograms of rice at one go. The name of Jagannatha Dasa is engraved on the Hande. The vessel is used even today to cook food for Anna Dana, Naivedya and Hastodaka. The Hande can be seen even to this day. Please give a seve to the Japada Katte Brindavana and partake the rice prepared from the Hande. There cannot be anything more holier than that. Bichale is 14 kilometres from Mantralaya. There are no facilities for pilgrims visiting here as the Government has not shown any interest in developing this scenic village. If you are visiting Mantralaya, you can combine a visit to Bichale and Panchamukhi Anjaneya. 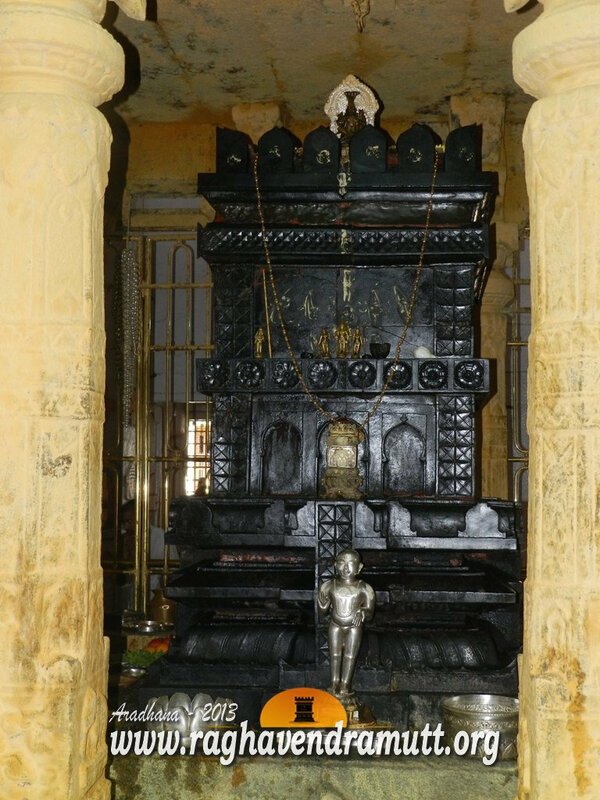 The Anjaneya temple is at Gandhal and there is a cave here where Rayaru meditated. It is also at this place that Hanuman showed himself to Raghavendra as five faced God. Both Bichale and Gandhal are in Raichur district of Karnataka and you have to cross the newly constructed bridge across the Tungabhadra to reach the two villages. The road from Mantralaya to both Bichale and Gandhal are bad. There are plenty of tempos and shared autos from Mantralaya to these villages. They can be reached from Raichur too which is nearby. If you have your own vehicle, there is nothing like it. You can take in several other sights that are connected to Raghavendra Swamy, Vyasa Raja and Haridasas such as Kowthalam, Kosigi, Manvi, Ibharamapura near Mantralaya, Penokonda, Adoni in Andhra Pradesh and several religious places of interest in Raichur district.